Liam Walsh of Irish Country Meats enjoyed the cakes baked for his visit by The Watergarden Café team in Thomastown, Co Kilkenny. Liam Walsh of Irish Country Meats (ICM) was invited to Camphill Thomastown, County Kilkenny for the handing over of the ICM donation of €4,500 towards recent energy upgrades. 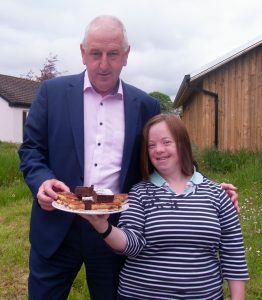 Some of the team from The Watergarden, Camphill’s café in the heart of Thomastown, were ready with a cup of tea and mouth-watering cake to say thank you. Irish Country Meats donation reduces CO2 and keeps Camphill Thomastown residents warm and cosy. This is a good news story co-ordinated by DaysE, as our mission is to deliver social impact through energy. In 2017, DaysE co-ordinated an application to SEAI for Better Energy Community funding. As a result of this funding, Camphill Thomastown and Irish Country Meats both received SEAI grant aid towards energy efficiency upgrades. Under the DaysE model, commercial beneficiaries of grant aid are encouraged to further support a community partner. Through its SEAI grant Irish Country Meats has delivered a more efficient water treatment system by recycling all of its water usage in the Navan plant. Irish Country Meats was introduced to DaysE by Micheál Galvin, Energy Consultant at Enviroeye Engineering. Micheál has supported DaysE’s projects since our inception. Liam Walsh, who lives locally, said “We are very happy to support this worthy project. I didn’t know much about Camphill until recently and it has been very enlightening to learn about the work here and the commitment from all involved. 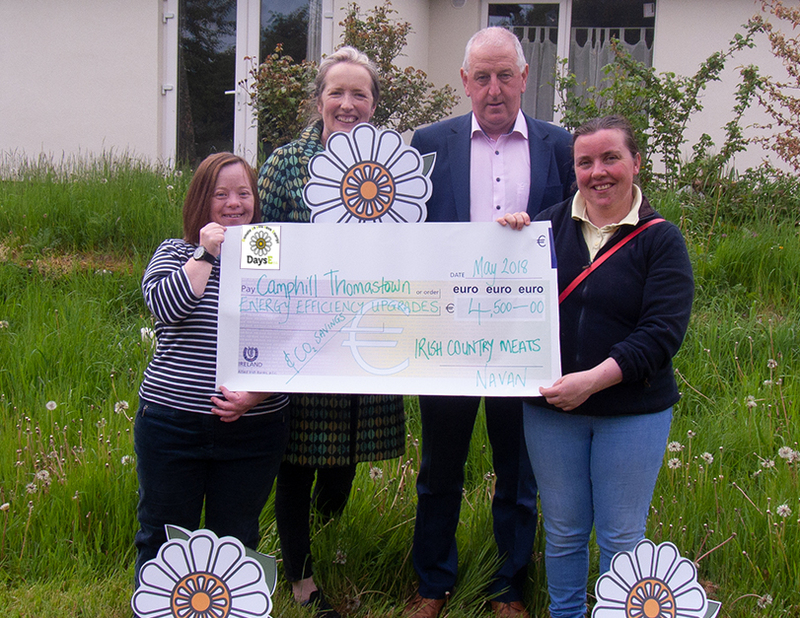 ICM are delighted to contribute towards making the independent living accommodation more energy efficient and of course more comfortable for the 5 people who will ultimately live in it.” Camphill Thomastown is presently supporting 9 people to live as independently as possible. Members of The Watergarden team with Grace Hamilton, DaysE and Liam Walsh, Irish Country Meats at the handover of the donation towards Camphill’s energy efficiency upgrade. The energy upgrades involved the transformation of 2 detached buildings through door and window replacement, external wall insulation and attic insulation. The heating system was also upgraded with a move from expensive oil boilers to renewable heat in the form of a pellet HDG Bavaria boiler which heats both buildings. The heating control upgrades allow for each unit to be controlled individually.